Take advantage of discounts on things you need to "travel better." We've specially negotiated for great deals and discounts on some of the products and services you most need when you travel, from language courses and luggage shipping to travel insurance, passport and visa processing, and emergency evacuation services. Just click through on the appropriate links below to take advantage of your member perks. Dr. Pimsleur's Method has been trusted for 50 years by U.S. government agencies, diplomats, corporations, and anyone who wants to learn to speak a language quickly and effectively. Just 30 minutes a day is all it takes to develop a near-native accent and become proficient in any of 50+ new languages. Whether you learn Spanish while driving to work, Italian while exercising, Russian while walking the dog, or Mandarin while waiting for a plane, you'll love the portability of Pimsleur Language Programs. Digital lessons play on the device of your choice: computer, tablet, iPod, or smartphone. Or take the more traditional route and order CDs you can enjoy in your car or home. Hideaways Aficionado Perk: Receive a 25% discount on Pimsleur Method CDs and a 10% or more discount on all other products in their online store. Get fast, professional, and secure passport and visa processing through CIBT Visas. Their Visa Pre-Check service saves you valuable time by having an experienced visa specialist review and verify that your application is accurate and complete or whether any corrections are needed. Too busy to manage your visa or passport request? Use the CIBT Concierge Service and have a dedicated specialist manage the entire application process from start to finish -- the highest level of hands-on, customized service available. Hideaways Aficionado Perk: Receive discounted service fees on passport and visa processing. Ship your luggage ahead to any destination in the world with Luggage Free, and avoid the many time-consuming (and back-breaking) hassles of carrying, checking, and claiming your luggage -- not to mention those excessive checked baggage fees! With Luggage Free, your luggage is guaranteed to get there and back safely, and in style. This service is a must for smart business and pleasure travelers. Hideaways Aficionado Perk: $25 discount on luggage-shipping service. Whether from the airport, city-to-city, or on private tours and sightseeing trips, Carey Chauffeured Services sets the worldwide standard for reliability, responsiveness, and attention to detail -- making your trip safe, seamless, and satisfying. Carey provides prompt and courteous door-to-door service based on your schedule, as well as hourly charters (think museum hopping or department store shopping) and "mobile concierge" services from their staff of professional, knowledgeable chauffeurs. You'll always travel in style and comfort with Carey, whether in a custom-designed Carey Lincoln Town Car, with additional legroom and state-of-the-art mobile office capabilities, or in a stretch limousine, a Lincoln Navigator SUV, a luxury motor coach seating up to 57 passengers, or the luxurious Mercedes-Benz S-Class sedan. Hideaways Aficionado Perk: Receive a 10% discount on Carey Worldwide Chauffeured Services. No matter where your journey takes you, Auto Europe and its partners can help you get there--and with the guaranteed lowest car rental rates. Auto Europe offers more than 10,000 convenient pick-up locations in 130 countries across the globe, so renting a car while traveling abroad has never been easier. If you find yourself in need of an airport transfer or are interested in hiring a chauffeur-driven limousine, Auto Europe can help there as well. Additional services include motorhome and RV rentals, GPS rentals, and $5/day portable "Mi-Fi" rentals--Auto Europe's European Wi-Fi solution that eliminates international data bill shock. Hideaways Aficionado Perk: Our personal recommendation for the best car rental solution for your needs. To take advantage of this perk, call Hideaways Travel Services at 800-843-4433, or visit the Auto Europe website . For many vacations, you need a car rental . . . and you don't want to be left with a lemon! Enjoy dependable, international car rentals with Avis and Hertz. Avis has more than 1,700 locations in the United States, Canada, Europe, Australia, New Zealand, and the Latin America/Caribbean region; Hertz has 1,900 locations in the United States and approximately 5,100 international locations. Rent a car--daily, weekly or monthly--at airports, in downtown and suburban business centers, in residential areas, and resort locales. Hideaways Aficionado Perk: Discounts and perks on car rentals. Cellhire's portfolio of wireless voice solutions includes the most advanced products and services available from leading brands in the industry. Each of Cellhire's solutions is tailored to meet the demanding needs of the frequent business traveler yet convenient and affordable enough for the leisure traveler simply wishing to stay in touch with the family. All solutions are backed by Cellhire's 24 Hour Global Customer Service, 365 days a year. Hideaways Aficionado Perk: Waived charges for standard GSM cell phone rental (shipping costs for phone and charges for minutes used are additional). Get the inside scoop on the best things to see and do in Paris-and beyond!-with the Girls' Guide to Paris GO-Card membership. As a GO-Card member, you get hotel, restaurant and shopping discounts and upgrades; exclusive access to special places and events in Paris and throughout France, like gallery and boutique openings; and money-saving deals on everything from spas and tours to cooking classes and car services Plus you'll receive a package of downloadable Paris walking tours that you can enjoy at your leisure. 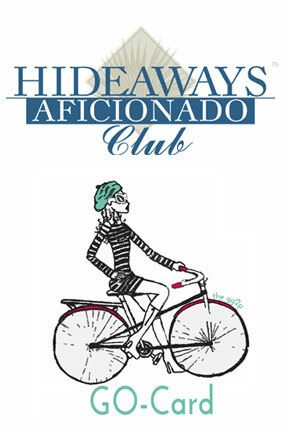 Hideaways Aficionado Perk : Save $10 - Click here to take advantage of this perk, and be sure to provide the coupon code HIDE10 when checking out. Become a privileged member of the Hideaways Aficionado Club and get all the "been-there" insight of our globe-trotting staff and ambassadors, as well as valuable membership perks and privileges--like a private dinner for two or sensuous spa treatment--at the hand-picked hotels, resorts, and cruise lines in The Hideaways Collection. Included in your membership is a subscription to Hideaways Life , our full-color, bi-monthly newsletter that's jam-packed with informative travel articles, timely travel news, and must-have advice from fellow members. You'll also benefit from expert, personalized travel planning with the friendly travel counselors of Hideaways Travel Services, who will help you plan your best, most seamless vacations ever. Learn more. Add the Girls' Guide to Paris GO-Card membership with all the benefits listed above, and your vacation dollars will go even further! With Park Ride Fly USA, you have access to off-airport parking facilities located nationwide. When you make a secure, guaranteed online reservation for hassle-free airport parking, you guarantee your parking space on your travel day; get complimentary luggage assistance; park securely in well lit, fenced-in facilities with 24-hour surveillance; can take advantage of the Frequent Parker Program, offering free days of parking; and get $100,000 of automatic flight insurance included with your reservation. Hideaways Aficionado Perk: Make a reservation at any Park Ride Fly USA offsite airport parking facility and instantly save 10%. We've had the chance to test a lot of travel products, both quirky and practical--from power-cord organizers to travel wallets and mosquito-repelling wristbands--and we've reported on them at Hideaways.com/travelgear. Some even offer a Hideaways-exclusive discount!